Vanee Condensed Chicken Noodle Soup is made with diced chicken meat and homestyle egg noodles for that homemade flavor and appearance.. Perfect in a bread or soup bowl, or as a base for signature soups. 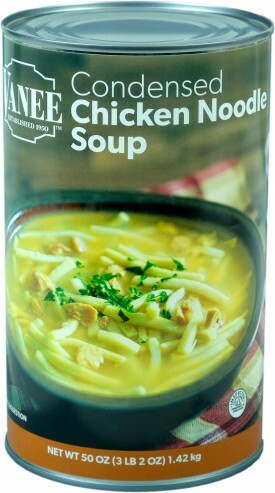 Vanee Condensed Chicken Noodle Soup contains no high fructose corn syrup, no added MSG, and saves valuable freezer space by being shelf stable, and doesn’t need to be thawed. Each 50 oz. can has 11 single cup (prepared) servings, for total of 132 servings per case. Serve in a bread bowl or soup bowl, or use as an ingredient for other soups. Preparation: Combine one can of condensed soup with one can of water. Convection: Place covered prepared product into 300°F oven for 30–40 minutes until center reaches 165°F. Conventional: Place covered prepared product into 350°F oven for 60 minutes until center reaches 165°F. Microwave: Place prepared product into microwave safe covered container. Heat on high approximately 2–3 minutes per portion or until center reaches 165°F. Stove Top: Place uncovered prepared product over medium heat for 10–15 minutes or until center reaches 165°F, stirring occasionally to prevent scorching. 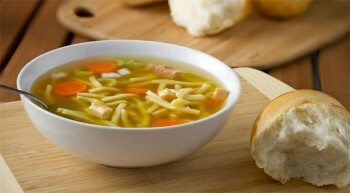 Chicken Broth, Noodles (Durum Flour, Eggs, Egg Whites, Niacin, Ferrous Sulfate, Thiamine Mononitrate, Riboflavin, Folic Acid), Cooked Chicken Meat, Chicken Fat, Food Starch - Modified, Salt, Hydrolyzed Wheat Protein, Sugar, Onion Powder, Turmeric, Carrot Powder, Dextrose, Flavoring, Yeast Extract, Disodium Inosinate, Disodium Guanylate, Torula Yeast, Annatto, Flavors, Canola Oil, Oleoresin Turmeric.